This image was taken in San Francisco, Calif. on Thursday, Dec. 13, 2018. SAN FRANCISCO (KGO) -- San Francisco police are investigating threats made to multiple locations in the city. Other cities across the country are also investigating similar threats. A law enforcement source tells ABC News there may be hundreds of the bomb threats around the country. In Washington DC alone there have been up to a dozen sent to businesses and schools. An FBI agent tells ABC News the bomb threats are currently deemed not credible, but they are taking up resources and time at law enforcement agencies across the country. However, a Representative from the FBI San Francisco tells ABC7 News they are taking the threats seriously and are thoroughly investigating. The Jewish Community Center in San Francisco was evacuated due to a nearby bomb threat. Police blocked off California Street near Presidio for the investigation. Those who were evacuated met at the library on Sacramento Street. A building on the 200 block of Brannan Street in San Francisco was also evacuated. Police in New York and Massachusetts are also monitoring multiple bomb threats at separate locations. An FBI official tells ABC7 News that the FBI is likely to get more involved in this as the number of locations increases and because it is crossing so many state lines. But the FBI official emphasized that as of now these threats do not appear credible. FBI San Francisco statement: "We are aware of the recent bomb threats made in cities around the country, and we remain in touch with our law enforcement partners to provide assistance. As always, we encourage the public to remain vigilant and to promptly report suspicious activities which could represent a threat to public safety." 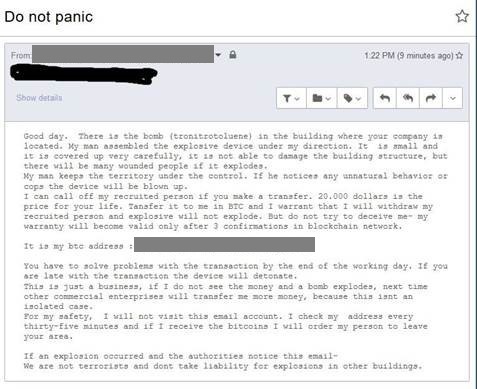 New York Police statement: "Please be advised - there is an email being circulated containing a bomb threat asking for bitcoin payment. While this email has been sent to numerous locations, searches have been conducted and NO DEVICES have been found. At this time, it appears that these threats are meant to cause disruption and/or obtain money. We'll respond to each call regarding these emails to conduct a search but we wanted to share this information so the credibility of these threats can be assessed as likely NOT CREDIBLE." FBI statement: "We are aware of the recent bomb threats made in cities around the country, and we remain in touch with our law enforcement partners to provide assistance. As always, we encourage the public to remain vigilant and to promptly report suspicious activities which could represent a threat to public safety."